Cavell Park is one of the marvelous neighborhood parks that make Minneapolis so livable, but I would bet that few Minneapolitans know where it is or have seen it. I thought I should promote it a bit before I leave the topic of Minneapolis parks and WWI completely. The only connection in this case is the name of the park, because it didn’t become a park until 1968. 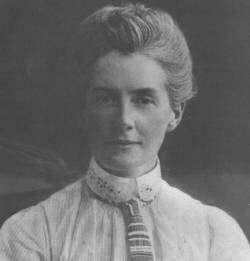 Edith Cavell was a British nurse running a hospital in Belgium at the outbreak of World War I. When the German army invaded Belgium, Ms. Cavell helped British, French and Belgian soldiers escape capture and reach safety in the Netherlands. As a nurse, she treated Allied and German soldiers, but her aid to escaping Allied soldiers led to her arrest and a charge of treason by the German army. She was held in prison for ten weeks as her case aroused outrage and indignation around the world. It did little good: she was executed by a German firing squad. Cavell— her name rhymed with travel—became a central focus of British propaganda efforts and, together with the German sinking of the passenger ship Lusitania, was used to depict the depravity of Germans, the barbarous “Huns” of an earlier article. 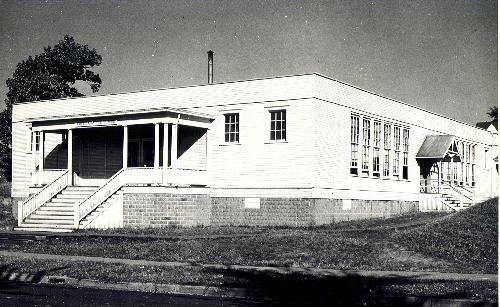 Edith Cavell School at 3425 Fillmore in 1948. With the start of the 1918 school year, at the height of the Great War, the Minneapolis school board was faced with overcrowding at Thomas Lowry School in northeast Minneapolis. The solution was to build two temporary portable school houses in the district. In December 1918, less than a month after fighting in Europe ended, the school board suggested that what had been referred to as the Thomas Lowry Annex, be named for Cavell. The park board had considered acquiring the site for a playground park in 1949, but in light of a 1948 cooperative agreement between the park board and school board to develop property together, the two boards opted to build a new school and park four blocks further east instead. That development became Waite Park and School. For those of you who live in south or north Minneapolis and rarely venture across the river, I’d suggest a drive, hike or bike ride into northeast to visit Cavell Park. Audubon and Windom parks are worth visits too. They are all quite different from the mostly flat parks of south and north Minneapolis. If you are considering a bike ride, I’d recommend it only if you are a fairly strong rider because the hills of northeast could be difficult for some. The highest elevation in the city of Minneapolis is near Waite Park, so you’ll enjoy a good climb from the river. Do you have a story about Cavell Park — or any of the great northeast neighborhood parks? We’d love to hear it as a coment on tis page. If you have photos, let me know; e’d love to see them. I am pleased I went to middle school at Edith Cavell School in Vancouver British Columbia Canada. It still stands tall as a place I enjoyed. Great memories and the administrators kept us up to speed on who the school was named after and why. A great tribute to a good person. Thanks, Bob. Great to hear from a native of Vancounver. A quick check of Wikipedia reveals that many more places were named for Cavell in Canada than in the U.S. Also learned that many French girls were named Edith in the months after her execution including, most famously, “The Sparrow”, Edith Piaf, who was born two months after Cavell was killed. I attended Edith Cavell School in 2nd grade, 3rd grade and had Miss Fink for a teacher both of those years. Then 4th grade with Mrs Farr. The school was closed in 1949 after it collapsed in that huge wind storm in October that was legendary from what I remember? That is a wind storm I would like to read up on! My uncle came to the school and had a long overcoat that he had me walk with him home (inside the coat). You couldn’t hardly see very far in front of you. No doubt he had come home from work, because of it. My father died in WW2 and my aunt and uncle lived with us. We lived on Fillmore street in the next block north. I remember Mrs Totino too. Later she became friends with my mother. While Waite Park School was being built all the students were bused to another school. Faintly I remember it was Schiller School? In lower NE Mpls as I remember it being said? I attended Waite Park school in 5th and 6th grades. My goodness what memories! Another story: My husband after that huge wind storm was home from school for 2 weeks he said. The whole family was out with farm wagons picking up field corn that were on the ground. His family farmed in SW MN. Great stories, Carolyn. Thanks! Later today or tomorrow I’ll post a few photos sent by another student from Cavell School. I played flag football there in the 70’s and we hung out there quite a bit. I remember needing funds to play and Rose Totino came through with a sponsorship for us! So kind and community focused! Growing up in south Minneapolis, I don’t have any connection to Cavell, other than attending a “temporary” wooden school building from 1954 to 1958 that looked just like Cavell. The school was established in the 1920s and named after WW1 Ambassador Walter Hines Page. The wooden building was torn down in 1958 and a new two story brick Page School was opened that fall at 52nd St. and 3rd Ave. It’s interesting to note that 25 years later, Page was closed and torn down because it wasn’t needed anymore and the site was converted to housing. The temporary wooden building lasted longer than the brick school. Great story, Tom, thanks. I wonder how many of those portable buildings were erected — and how many portables still stand. What a great site that was a for a school, near Minnehaha Creek. Curious about Page School, I just looked it up at http://mpshistory.mpls.k12.mn.us/Page.html and found some great photos of the older and the newer schools. Only one thing remains from Page School: part of the land at the Hiawatha School Playground, a public park, at East 43rd Street and 44th Avenue South! 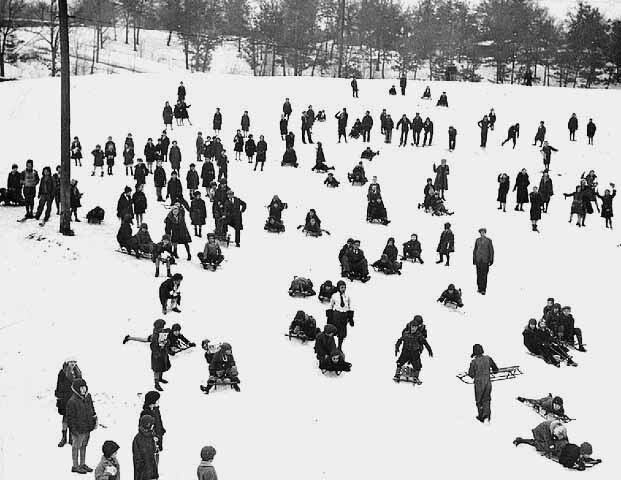 In 1931 the park board traded some land with the school board. The park board gave up a bit of land between Page School and Minnehaha Creek and a bit of land it owned next to Hamilton School along Victory Memorial Drive in exchange for school board land adjacent to Hiawatha School. I presume the land at Page and Hamilton schools was used to expand playgrounds, too. i’ve been pronouncing the name wrong forever! Haven’t we all, which is why I wrote only that her name rhymed with “travel.” I suspect that popular usage makes the name of the park ca-VELL. BY the way, the other names under consideration for the school according to the Minneapolis Tribune in December 1918 were much more mundane: William Windom, Alexander Ramsey and Thomas Jefferson. Thanks for reading.